« What’ll You Give Me for an Hour of Prime Time? NAB is only a few short weeks away, and I’ve heard very little about Adobe’s Mercury technology, slated for a “future release” of Premiere Pro. There’s a video demo and a blog page on the Adobe site (and a couple of other videos here and here), but no word of when the technology will make its appearance in a product you could buy. I looked at the demo again the other day and despite its over-hyped style, it seems even more impressive the second time through. (My first post on the subject is here.) Will they release it at NAB, as part of Adobe CS5? If so, I think they’re going to make some waves. The demo shows the editing of 9 streams of P2 media — each carrying a 3D effect. And it shows live multicam editing of 4K native red files. Yes — four streams of 4K Red (though it isn’t clear how much debayering they’re doing, which is critical). All this on a well-equipped PC with a $1400 video card (and what looks like 24 Gigs of RAM). As a little bonus, they demonstrate multi-stream playback of native AVCHD files and the ability to ingest and edit native digital SLR video. I haven’t edited anything with Premiere. But from the demos I’ve seen the product is a study in contradictions. It can handle all kinds of files in their native state and can transcode and output to other formats in the background. It can directly import After Effects projects. It can do digital dialog transcription. But trimming is badly crippled. It has a cluttered interface that wastes too much space on video controllers and timecode displays. And it seems to have zero film support. Of course, we won’t know how Mercury shapes up until after it’s released. But even if there are problems, it points toward a world where 4K editing and conforming will become commonplace. Whether we see it at NAB or not, it looks like 4K is coming soon to a desktop near you. This entry was posted on March 12, 2010 at 9:04 pm and is filed under Adobe Premiere, Avid, Workflow. You can subscribe via RSS 2.0 feed to this post's comments. You can comment below, or link to this permanent URL from your own site. I used Premiere about four years ago (they may have updated it since then) and the one thing that really drove me crazy was that you could only have one bin window open at a time. Also, it looked like editing with more that two audio tracks in the timeline could have been a big pain, but I never used Premiere long enough to find out if that was true or not. I have a feeling it’s come a long way since then. I actually saw the video one time, but didn’t watch it long enough to see the 4 streams of R3D. It is impressive. 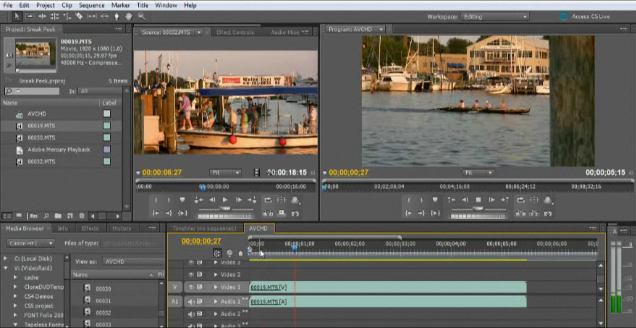 The overall CS4 suite is impressive, but I don’t think that as an editorial tool it will replace MediaComposer or FinalCut. Not as much because of functionality, more so because people are set on their personal editorial software platform. That being said, CS4 has a lot of hooks to import FCP and MediaComposer into Premier. Once in Premier and the rest of the suite, a lot of new media options become available. Speech to text, Blu Ray DVD authoring, Auto roto from comparable shots, review and approval to Acrobat with notes back to the timeline, DVD to web output, and embedding the text into a Flash stream which is searchable. Adobe cares a lot about leveraging their technology to become an integral part of intelligent video delivery over the internet. I’m impressed with Adobe’s committment, unclear whether their messaging (not their technology) will resonate for the market. My Company, Key Code Media, is eagerly awaiting the potential CS5 release, especially to how CS”5″ can integrate into the Red, Panasonic P2, Sony EX, JVC and DSLR production pipeline, interchanging media and meta data with both Apple Final Cut Pro and Avid Media Composer. Well said. I think that about sums it up. We’ll see what happens at NAB. For someone who has never actually used the application, you certainly have no problem commenting on it. I would take a little extra time to really get to know the program before skewing your audience in any one direction. The issue with Premiere is that while it looks fantastic on paper, it’t tiny details that drive you nuts while actually working – for example, in last three revisions, they TOTALLY reworked track patching. In CS4, there is some kind of weird hybrid patching panel that just doesn’t make sense if you edit from keyboard. Then, there’s nothing like Premiere going down with “Serious error”, or Capture window teeling you to “reset your camcorder” because it “cannot activate recording device”. And weŕe talking turnkey system here, built by a vendor specifically for Premiere. Next – there is no intermediate codec, which renders Premiere really hard to work with in tapeless workflows. I’ve tried verya hard to like Premiere, but no thanks, I will stick to my Final Cut.